Although the pattern for this bag was published nearly 50 years ago, the design itself has timeless appeal. Knitted up in two colors, with lots of room inside for all your bits and pieces, this classic purse is sure to become a favourite. , or a similar yarn to obtain the specified gauge. COATS & CLARK’S O.N.T. “SPEED-CRO-SHEEN” MERCERIZED COTTON, Art. C.44: 3 balls of No. 12-A Blue Sparkle and 2 balls of No. 1 White. Clark’s O.N.T. Plastic Knitting Pins, 1 pair No. 4 (3.5mm sized). Clasp … 1/4 yard of silk for lining, cardboard, cord. Gauge: Pattern Stitch = 6½ sts make 1 inch, 12 rows make 1 inch. BOTTOM … With Blue Sparkle, cast on 16 sts. Work in stockinette st (k 1 row, purl 1 row), increasing 1 st at both ends of every other row until there are 36 sts on needle, ending with a purl row. Now dec 1 st at both ends of every other row until 16 sts remain. Bind off. Note: The 2 slipped sts in the pattern are slipped as if to purl – when slipping the 2 sts in the knit row, keep yarn in back of sts; in the purl row keep yarn in front of the 2 slipped sts. SIDE PIECE (Make 2) …Starting at lower edge with Blue Sparkle, cast on 62 sts. 1st row: K across. 2nd row: P across. Now work in pattern as follows: 1st row: With White, K 2, * sl 2, k 6. Repeat from * to last 4 sts, sl 2 k 2. 2nd row: With White, * p 2, * sl 2, p 6. Repeat from * to last 4 sts, sl 2, p 2. 3rd row: With Blue Sparkle, * k 6, sl 2. Repeat from * to last 6 sts, p 6. 5th and 6th row: Repeat first and 2nd rows. 7th row: With Blue Sparkle, * sl 2, k 2. Repeat from * to last 2 sts, sl 2. 8th row: With Blue Sparkle, * sl 2, p 2. Repeat from * to last 2 sts, sl 2. The last 8 rows constitute the pattern. Work in pattern, increasing 1 sl st at both ends of next row and every 8th row thereafter until there are 70 sts on needle. Work in pattern without increasing until piece measures 9 inches in all. Bind off. STRAP … Starting at point with Blue Sparkle, cast on 3 sts. Work in stockinette st, increasing 1 st at both ends of every other row until there are 11 sts on needle, ending with a purl row. Work in stockinette st for 2 rows. Next row: K 3, bind off 5 sts, k 3. Following row: P 3, cast on 5 sts, p 3. Now work in stockinette st, until piece measures 5¾ inches in all. Bind off. FINISHING: Cut a piece of cardboard the same size as bottom of bag. Cut 2 pieces of cardboard for Side Pieces as shown in diagram. Sew up side seams of Bag. Sew Bottom to Side Pieces. Insert cardboard bottom and side pieces to inside of bag. Line with silk. Sew Handle around cord and sew in place 2 inches from each side of center of one Side Piece. Cut a piece of cardboard the same size as Strap. Line Strap with silk, inserting cardboard and cutting buttonhole to match the buttonhole on knitted Strap. Sew Strap to center of same Side Piece 2 inches down from top. Sew clasp in place. Fold sides in to shape Bag. Source: Coats & Clark’s O.N.T. Quick Tricks, Book No. 307, First Edition, 1954. 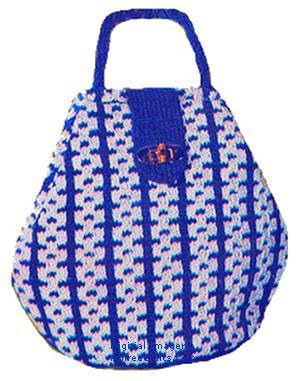 Knitted Bag, S-624, p. 14.